Hello all you flapjack fans out there. 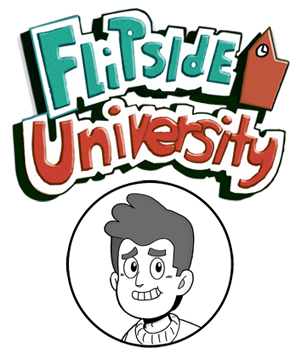 Ryan here, and I am proud to announce that the a new chapter of Flipside University is starting. FU: Chapter 01 - Through Thick and Thin focuses on Josh attending the infamous post secondary institution, Flipside University and begins with our protagonist Josh Neilson and his best friend Dane Marsters arriving for their first day of classes. However, when honey moon phase wears off and Josh soon discovers that life on campus is not all what it seems. Interested to find out what happens? Want to read more? Then venture onward to continue reading! Oh and just a side note: I'm only updating FU with rough pencils. Inked, full color pages will follow after Chapter 01 (and possibly beyond) is completed. Flipside U or FU for short is created and drawn by Ryan JS Chandler of Flapjack Studios. He also has a comic in the local newspaper called Living With Stacy. Please feel free to explore the website or browse the comic archive.